The beginning of my journey instrumental can be defined quite common, at least until a few years ago. In fact, while from ‘ 84 to ‘ 86 I devoted myself to the general knowledge of the sky and constellations as well as the main objects contained in them dall’1987 2000 I switched to a classical Newtonian reflector 114/900 of the Konus . In 2001 I purchased a Meade 203 mm f 6.3 Lx6 with whom I started to enter the world of astrophotography (using a Yashica SLR LX 2000, and then the film photochemistry ) . 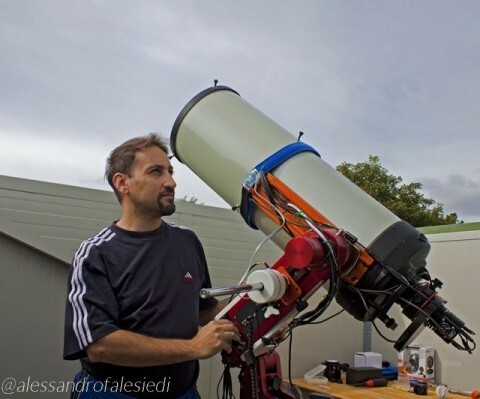 In 2005 the main tool has been replaced by a Meade LX200 ACF 10 ” f 10 all backed by an Orion Atlas EQ -G.
In the same year I opened the road of digital astrophotography thanks to a Canon EOS 300D then replaced by a more powerful Canon EOS 350D Baader modified . To enrich the park tools along with several accessories photovisual ( barlow lenses , eyepieces , filters , etc …) came in 2009, also a Skywatcher ED80 refractor semiapocromatico that gave me my first year successivo.Nel APOD September 2011, the mine supplied was enriched also a astrograph newton Boren Simon 200mm f 2.8 , but then aware of the need to have a single instrument that could operate at different focal lengths in relation to the variables seeing conditions and atmospheric turbulence typical of my zones (and therefore selling all the equipment listed above ) , in February 2012 has arrived a Celestron C11 HD to where the fire is currently being used a Starlight Xpress H964 monochrome CCD camera (replacing the previous SBIG ST8300 ) . Completing the optical train a 5-position filter wheel Starlight 50.8 and an excellent off-axis guide of the LB Proxima Astro . In 2011, in order to finally have a reliable frame that I could also allow shooting at long focal length , I also equipped with M1 Avalon Fast Reverse . It will be the definitive instrumentation ?